August 4th- August 18th. Two Weeks in Two Rivers, Wisconsin. Our 19th state. Oh how we LOVE two whole weeks in one spot! We were able to enjoy a weekend without driving. We also were able to receive letters and care packages. Our favorite was from the Mangels Family. They sent us a One Year Nomadiversary celebration package. The girls were so surprised that the online Oregon Trail game they’ve played for years is also a board game! We will celebrate our Nomadiversary on September 2nd. Thank you for everyone that took time to send us something. When we get a sticks and bricks home again, we will never take for granted the small act of walking to the mail box to retrieve our daily mail. 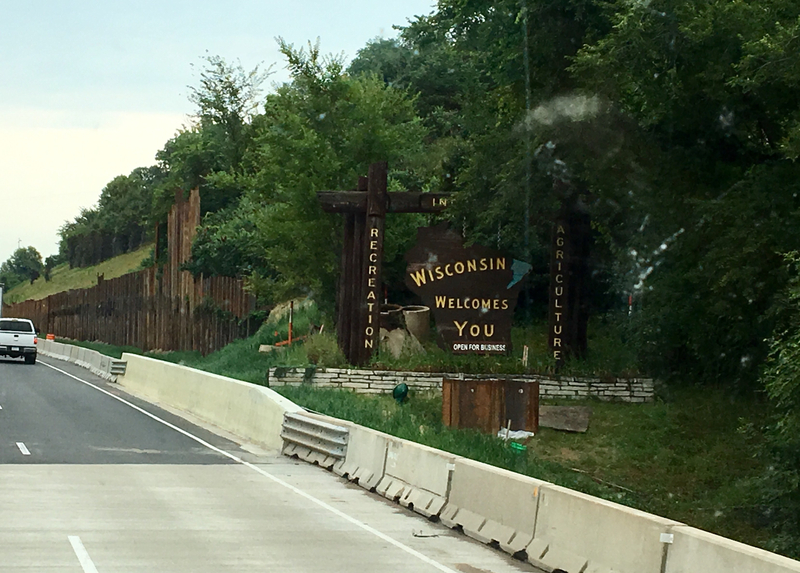 Wisconsin is known as America’s Dairyland. Driving through the state all we saw were fields, farms, barns and silos. It reminds me of rural Maryland where I grew up. We ate a lot of cheese and ice cream these two weeks! That may be why we loved this stop so much. We decided to stay in Two Rivers, WI in Manitowoc County right on Lake Michigan, the first of our Great Lakes visits. We stayed at ‘Village Inn on the Lake’. They have an indoor pool and mini golf. We were surprised that they advertised mini golf but still charge $3 pp to play. This is the first park that has charged us to play putt putt. We did play a round and then won a BOGO so we played again on our last night here. The girls enjoyed the pool but we had a tough time one day with trying to play with two girls about their age. But the other days they did just fine. It’s just an example of how not everyone is meant to be friends. The roads out here are named by letters in the alphabet. We saw a AAA (American’s American Adventure). We enjoyed nightly walks or bike rides across the street to the Maritime Trail that runs from Manitowoc to Two Rivers. We were right in the middle of the six miles. This trail runs right along the shoreline of Lake Michigan from lighthouse to lighthouse. They’ve done such a nice job with the gardens along the way. It is hard to wrap my brain around the fact that this is a freshwater lake and not an ocean because the waves lapping on the sand beach looks just like an east coast beach. When I get a whiff of the fresh flowers as the breeze blows across my face, I’m reminded it’s not an east coast beach town. The girls lucked out with free books at a lake side Little Free Library. We keep a bag of books just for exchanging them at Little Free Libraries along the way. Two Rivers is the birthplace of the Ice Cream Sundae. In 1881, George Hallauer asked Ed Berner, owner of a soda fountain, to top his dish of ice cream with chocolate sauce, which had only been used for ice cream sodas. It became a popular concoction, but was only sold on Sundays. One day, a little girl asked for one, saying they could pretend it was Sunday. Voila — sundae (the spelling is attributed to a mistranscription). In 1973, the State Historical Society dedicated a marker in a downtown park commemorating the first ice cream sundae. Every July, the town celebrates Ice Cream Sundae Thursday. We were stoked when we laid our eyes on this blast from the past. It wasn’t a Blockbuster ( I think the last Blockbuster is in Oregon) but it was a video store. We parked so we could take a trip down memory lane and show the girls what a video store was all about. We spent nearly an hour in there, walked out with a membership, 5 movies and 1 Xbox game. The movies are only $1 each to rent but we got them for .50 cents each because of the new member special. And we get to keep them for a week! I had not read about this place until I picked up a magazine when I check in upon our arrival. We packed our school books and headed out to check it out one day. When we arrived we found out that they had only been open for 10 days. The brand new educational center is state of the art and very nicely done. We hadn’t packed our lunch and found out that their cafe wasn’t complete yet so left and drove about 10 minutes to grab lunch and then came back for our diary farm tour. They take you on a coach bus to a working farm and drive you through while watching a video that explains all the aspects of dairy farming. The one thing we were really hoping to see was a calf being born. The Discovery center has a birthing room with a viewing window and bleacher type seats. Upon arrival we asked about this and she said they didn’t have any cows in active labor today. When we got back from lunch the receptionist told us that there was a cow in the birthing room but not in active labor. After our tour we got our school books and went into the birthing room and worked very quietly (the girls actually were taking a science test) while we waited patiently. As they got close to closing time, a women came in and chatted with us. She went and got the vet and asked her to check on the cow. They didn’t think she’d give birth until late that night. We were disappointed but understood you can’t plan natural birth. It turns out the women was a director and after explaining that we don’t live here so we can’t try to come back again as she had suggested, she wrote us passes to come back the next day (it cost about $30 for all three of us to visit so that was so nice) but call first to find out if any cows are in active labor since we are only staying about 15 minutes away. I started calling in the morning as we headed in that direction. We first visited a cheese factory and then had picnic lunch at a local park while we did our school work until at 1:45 when I called and was told that there was a cow in active labor. We packed up so quickly and drove 10 minutes through the country roads (of course we got behind a tractor for 5 minutes!) and pulled in hot to the parking lot. Jumped out and ran in, the receptionist recognized us and said run back there! We arrived as she was pushing her baby out. It was amazing to witness the first breaths of life. I’m pretty sure one of my daughters is scarred for life! If you are really interested in watching the birth, click on our YouTube video. This is the park we visited out in the middle of nowhere that we just passed by on our way to the cheese factory and decided when we were done and if they cow wasn’t ready we’d stop here for lunch. I love waterfalls so we thought we’d check out a waterfall in the middle of flat farm land. I was wondering just how big it would be….as you can see from the picture, it’s tiny but still so beautiful sound among the trees in the middle of the prairie. I’ve shown you ice cream and diary farms, but where’s the cheese you ask? Yes, Wisconsin is known for their cheese. For the cheese experience, I drove out to Henning’s Wisconsin Cheese factory. It is a family owned business based in Kiel, Wisconsin that offers hundreds of varieties of cheese, including several that have won awards. This year they won the Gold at the World Championship for their Hatch pepper cheddar. They have a cheese museum and viewing windows to watch cheese being made. We learned all about curds and whey and the cheese wheel. We learned a little back in Oregon at Face Rock Creamery but this place had videos and people stopping to answer all our questions. We ate warm curds fresh from the factory and learned what the sales lady meant by ‘squeaky’ cheese. After learning how string cheese is made we tried Mozza whips. Mackenzie and Chris were big fans of this salty treat. Hennings is also home to the Mammoth Cheese wheel. Have you ever seen a giant cheese wheel at a grand opening at a Grocery store or a big event? If so, this is where it was made. They are the only ones in the nation to still make Mammoth Cheese wheels (anything over 70 lbs). They used to give public tours in the back and would show you the mammoth wheels but they stopped doing this about a year ago. After the sales lady told us this she saw the disappointment on our faces as she lead us over to the picture on the wall. We thanked her for all her great information and went over to the case to pick our our cheeses we were going to purchase. Five minutes later, she came up behind me and said, “Put the cheese down and follow me quickly to the back.” I grabbed the girls by the hands and they looked up at me with a look of confusion that mirrored mine. We found ourselves standing in front of a door and being asked to put our hair in a ponytail and to put hairnets on. She said she’d sneak us back to the cooler to show us the mammoth wheel that’s prepped for delivery. Y’all this thing weighs 4,090 lbs!! This lady was so sweet, she even offered to take a picture for us so you can really see how big this thing is! While at the Discovery center I chatted with a local that recommended we drive out to Pine River Dairy for .25 cent ice creams. We headed over after the birthing experience and enjoyed a scoop of ice cream and also bought our cheese hats for the game. As it turns out, if you purchase something, you get a FREE ice cream. When in Wisconsin… you go to a Packers game wearing cheese hats ! Lambeau Field is celebrating 100 Seasons of Green Bay Packers. What’s more American than visiting the football team that won the first two SuperBowls? Titletown outside the stadium is an amazing park with playgrounds, football tables, ping pong tables, horseshoes, bean bag games, a hill to sled down during winter, a football field for anyone to enjoy. We had fun throwing the football (which was provided) and running them in for touchdowns. We ate dinner at Kroll’s before the game. Packers win 31 to 17 to the Tennessee Titans. It’s a Wisconsin thing, just as chili is to Texas or Barbeque is to South Carolina. It’s just ranks up there with their ‘cheese’. This dates back to medieval times with the Catholic church. Because Jesus was crucified on a Friday, so on Good Friday, Catholic’s were instructed to not eat warm blooded meat in observance. However, since cold blooded was still okay, fish was on the menu! The Irish, German, and Polish, Catholic immigrants brought this tradition with them to Wisconsin. Wisconsin Friday Fish Fry isn’t just during Lent anymore, it’s year round. Many places serve locally sourced fish, like Northern, Walleye, and Perch, but most places you will find the traditional Cod, with sides like coleslaw, french fries, and rye bread. Instead of going to one of the local restaurants, for their Friday night Fish Fry, I was excited to find a local Catholic Church in Manitowoc, that was hosting one along with a festival. We ordered Perch and Cod so we could taste the difference. Manitowoc was the city south of us about 3-4 miles. One day, on a lunch break, we drove to the lighthouse and discovered we could walk out to the end along a break wall which was quite a experience. The lighthouse has been used for 100 years to guide boats into the port but was not well maintained. They just recently renovated the outside and the next step is to one day open the doors to the public. They just celebrated the 100th anniversary. From here, we were able to see the submarine and the car ferry. We didn’t actually have time to go through the museum, just stand here in the park outside the museum. We tried another Wisconsin culinary tradition, deep fried cheese curds. Seriously, we are hooked. I’m surprised these aren’t all over the country. Nashetah is voted ‘Best Beach in Wisconsin’. We enjoyed a Saturday afternoon playing bocce ball at this beach. The girls and I went kayaking out here one afternoon because they had read a book about kayaking on Lake Michigan and wanted to do it as well. Chris rode his bike here after work to meet us. It’s nice to swim in the Lake and not feel sticky afterward. Chris played golf at Black Wolf Run, The River Course. Number 15 in public courses and 97 in all courses in US. On our second Sunday we drove up to Door County to explore the area of the state that looks like the spout on the tea pot. The county is the northeastern bit of Wisconsin that sticks out into Lake Michigan like a thumb. We stopped by Cave Point and loved the view. People were jumping off the cliffs but we had a day planned of visiting lighthouses and going out to lunch so we decided to leave there and head up the coast to do the rest of our sight seeing so we could come back later and do our our jumping at sunset. When we came back, there were only a few people here! We love visiting places when the crowds are low. We had so much fun jumping off the cliffs. The water was really cold but when your adrenaline is racing you don’t seem to notice. It’s always a good idea to pack bathing suits, towels and water shoes… just in case. In Sisters Bay, there is a Swedish restaurant that has goats on the roof. We had lunch there before exploring the lighthouses. We were able to walk out to this island that is just under 9 acres and has a 89 foot tall light house that is more than 140 years old. The walk out there was the highlight… because you have to wade through the water to get there. The water over the causeway continues to be a little high with lake water levels being where they are this year. They have a free tractor and wagon to shuttle you across if you prefer to keep your feet dry. The last tractor ride is at 5:00pm because the last tower climb is at 4:30pm. We just missed the tower climb but it was nice to have the island all to ourselves after we watched the last folks leave on the tractor. We saw a dead porcupine on the side of the road and just had to get out to feel the quills. We stopped in the village of Ephraim and visited one of the more famous buildings on the peninsula. The building is on the National Register of Historical Landmarks. The city of Ephraim “encourages boaters and visitors to continue the tradition of adding nautical names to the walls as long as they do so tastefully.” They give some instructions: “Inappropriate words or symbols will not be tolerated. Do not use spray paint, carve or scratch the wood.” And then they give a warning: “Persons caught defacing public property inappropriately will be prosecuted to the fullest extent.” So you have the blessing to deface the public property all you wish, as long as you do it appropriately. We did not come prepared with paint and paintbrushes like the other family we saw there but we did have a flair pen in the Jeep so we added our names to the building. Since we had two weeks here, the first Monday I found the local library which was so close we could ride our bikes to on the Maritime trail. This library rocks…it says so on the window! Because the kids are still on summer break here they had activities going on every day. The girls participated in Maker Lab, the Music Room, Boredom Busters Day and an end of the summer carnival. They played checkers and organized books during breaks of school work. The weather was great while we were here so we had our lunch outside everyday. We tried A&W fast food joint for the first time. We’ve seen them several places but never stopped to try one. As it turns out Chris is the only one that is a fan of Root Beer floats. Great post. Was fun reading. So did she throw a male or female calf? Oh darn, I can’t believe I forgot to say. It’s a girl!